Welcome to Hotique's guide to glasgow's boutique hotels. Glasgow has always had an edgier feel than Edinburgh, but lagged behind the capital when it came to Hip Hotels. The recent renovation of One Devonshire Gardens, means that glasgow now has arguably one of the best boutique hotels in the Scotland. For those looking for a city centre boutique hotel the ABode has quirky modern rooms. Hotique's luxury hotels are situated in a perfect location within walking distance of all the main sites including the shopping area Sauchiehall Street, Buchanan Street, Bath Street, George Square, the Merchant City, the Glasgow Film Theatre and Conference Centres such as the SECC. 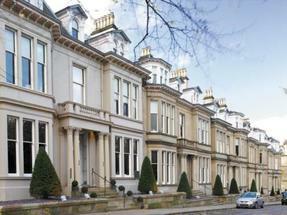 One Devonshire Gardens - best boutique hotel in Glasgow. A luxurious townhouse hotel with 49 rooms, in Glasgow’s West End, One Devonshire Gardens has been a Glasgow favourite for over 20 years. Following the recent renovation, it retains all the charm and character of the original hotel – with an added contemporary twist. The Abode is right in the heart of Glasgow City Centre on Bath Street, beside all the best restaurants and lounge bars, and one street away from all the shopping in Sauchiehall street. Less luxurious than One Devonshire Gardens. For those looking for a place to relax en-route to the highlands, Mar Hall is 10 minutes from the airport and is a good option for those wishing to relax before heading further North.